So, nothing like leaving it to the last minute…but I like this sort of block and always have loads of scraps on hand, and, more importantly, have finally finished the sewing project which was hanging over me, preventing me from feeling I could do anything else before it was done. It’s been a very busy year for me – very little time at home coupled with a bad virus during one of my holiday weeks – and I don’t think I’ve played in the lotto at all until now. However, better late than never, and perhaps 2017 will be a better year for me & the lotto. I still always keep my eye on what you all are doing! 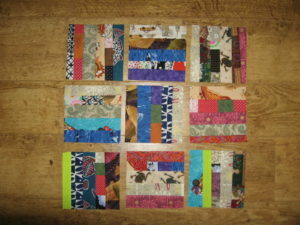 And here’s 9 blocks for December. Until I read it,I didn’t realize that you haven’t made any (other) lotto blocks this year … welcome back and happy new year.